Digital Subscriptions > Learn Hot English > 174 > EMERGENCY 999! Objective To improve your reading and listening skills. Think about it Why might someone call the police? What could have happened? Why would someone call the fire brigade? What sort of emergencies do they deal with? Why would someone call for an ambulance? What sort of injuries would they typically deal with? How would you rate the emergency services in your country? What are their strong points? How could things be improved? Exams This reading and listening activity will help prepare you for English exams such as FCE, IELTS and TOEFL. What emergency could someone possibly have in relation to the following things? 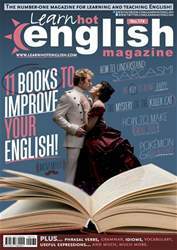 The latest issue of Hot English (174 – the November issue) is out now! Learn over 300 useful words and expressions and improve your listening skills with Learn Hot English! This month: 11 books to really improve your English, 24 words for describing places of interest, 24 spooky words, 12 horror words, 10 useful idioms for talking about creepy topics, 8 “mystery” phrasal verbs... plus: • Gaming – the Pokémon GO! craze • Health – ridiculous fitness trends • Mystery – the Beast of Bodmin • Grammar – the future perfect • Language – how to recognise sarcasm • Marketing – unusual services • Science – the Ig Nobels • Relationships – dating disasters • Travel – at an ice hockey game • Film – Star Wars: The Force Awakens • Food – how to make a one-pot pasta • Conversation – how to make small talk • Cinema – our top 5 spooky films • Music – boy bands • Life – how to be happy • Medicine – medical advances • Humour – the Ancient Romans AND LOTS, LOTS MORE! By reading and listening to all this great content, you'll improve your English reading and listening skills and learn up to 300 useful words or expressions. Plus, you'll get a better job and pass English-language exams more easily. Guaranteed! THE MYSTERY OF THE BEAST OF BODMIN! UNUSUAL SCIENCE PRIZES: THE IG NOBELS! Movember An unusual charity event. 11 BOOKS TO IMPROVE YOUR ENGLISH! WHAT’S YOUR FAVOURITE FORM OF TRANSPORT? BRING A LITTLE “HYGGE” INTO YOUR LIFE! WERE THE ANCIENT ROMANS FUNNY?